Also some discussion of Russell Wilson's contract and officiating. You still have Seahawks questions? We still have attempts at answers. Our latest mailbag attacks questions on the kicking situation, the future of the offensive line, officiating, and more. Do you think Seattle will finally address Steven Hauschka's departure, or put another band aid on it like they have the past two seasons? A: Band-aid is an interesting phrase for what they did last year. I think Seattle tried harder than that to address it, first bringing in Jason Myers — who ended up in the Pro Bowl with the Jets — and then signing who was probably the most proven veteran easily available in Sebastian Janikowski. True, he was 40 when he signed. But we’ve seen good kickers (Matt Bryant, Adam Vinatieri) kick well (and KICK well) into their 40s. I don’t think the Seahawks viewed those moves at the time as simply a one-year thing and then having to try again. 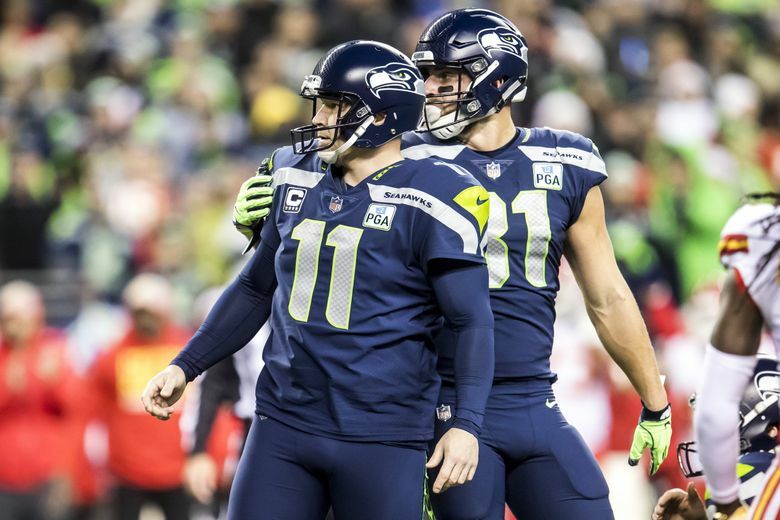 But no doubt, that’s how it appears to be turning out as Janikowski showed his age this season while Seattle may regret having passed easily on Myers, who at age 27 had a career-making season in New York, hitting 33-36 field goals and 6-7 beyond 50. But Myers was far less proven a few months ago than Janikowski — and basically less proven than Blair Walsh was heading into the 2017 season (and as I’ve noted before, it’s easy to forget how unproven Hauschka was when Seattle got him in 2011, having been waived or released by five different teams before becoming a Seahawk). Walsh didn’t work out, and Janikowski also appears to be one-and-done, and it’s easy to say now they should have just bettered the deal Hauschka got with Buffalo and kept him, which would have meant a three-year deal worth $9 million or so. But Hauschka had his struggles down the stretch his last season in Seattle and that, combined with the money it was going to take to keep him, led Seattle to explore other options. We’ll see what Seattle does now. They signed Sam Ficken shortly after the season, an even younger and far more unproven kicker than Walsh or Myers, and I’m sure they will continue to look and see who becomes available either in free agency (such as Robbie Gould, if nothing works out with the 49ers) and in the ranks of those coming out of college (with just four picks at the moment, you’d doubt they’d use a pick on a kicker). Whether it will have proven to be more than putting another band-aid on it, though, won’t really be known for years. No one knew when Hauschka was claimed off waivers by Seattle a week before the 2011 season that they’d signed a player who would go down as one of the best kickers in team history. But without question, Seattle is going to hope it can get a little more consistency and long-term reliability out of that position going forward. Crazy (but knowing Schneider, definitely possible) scenario but what do you think happens if they chose to let Wilson walk. Do you think the Paxton Lynch signing is a possible foreshadowing? A: To answer the part about Lynch, a big huge NO. Paxton Lynch’s signing has nothing to do with Russell Wilson other than trying to add someone to compete to be his backup. As for letting Wilson walk, I don’t see that happening at all. I covered the basics of Wilson’s situation earlier this month here while columnists Larry Stone and Matt Calkins have also offered up their thoughts here and here. I think Seattle will seriously consider placing a franchise tag on Wilson for the 2020 season if a long-term deal is not reached prior to then. But my guess would be that eventually a deal will be struck keeping Wilson around for a few more years. OL depth. Who is available in FA? I prefer having a veteran OL group. What is your take? Which possible DE is worth not trading down in the draft? A: Recall that Seattle has tackles Germain Ifedi and Duane Brown and center Justin Britt under contract for 2019. So the Seahawks appear pretty set there (and I imagine they’ll retain restricted free agent George Fant to keep him around as competition for Ifedi and backup at both spots). That leaves guard as the most pressing concern as both of last year’s starters —- D.J. Fluker and J.R. Sweezy — can be unrestricted free agents in March. Seattle would like to keep both and will work to get that done, and if so, then I don’t see the Seahawks dipping heavily into the free agent ranks other than maybe signing someone to a one-year, minimum deal as depth. And re-signing Fluker and Sweezy may be the best bet for the Seahawks based on the free agents who may be available. WalterFootball.com’s rating of the guards who may be available lists as No. 2 none other than Mark Glowinski, who was waived by Seattle a year ago. That’s not meant as a knock on Glowinski, who by all accounts has improved markedly since his time in Seattle (he was a fourth-round pick in 2015 who started 19 games for the Seahawks from 2015-17 before being waived) but more a reflection that there rarely are current All-Pro offensive linemen easily available on the open market. The Seahawks also remain high on Jordan Simmons, who played well in place of Fluker and should be recovered from a knee injury in time for the 2019 season, and still have Ethan Pocic (Pocic started and played all of the win against the Chiefs). the officiating has been horrible this year unlike any other year I can remember… what are they going to do about that! A: I understand the sentiment but I think there may be some recent bias at work in the proclamations that NFL officiating has been worse than ever. NFL history is littered with controversial calls that drew reams of complaints at the time and calls for change (the Immaculate Reception?). The NFL, contrary to what may be thought, does hold officials accountable. As ESPN noted in October, the league has turned over roughly one-third of its officials over the past five years, most for performance reasons. The NFL also began making officials full time in 2017 and is now up to 24 full-time officials, another move designed to try to improve officiating. There could be other answers to the specific New Orleans Saints controversy, such as expanding which plays and calls can be reviewed — expect that to be a major focus of the league meetings in March and again in May. But in general, what the league will do to improve officiating is probably more of what it has been doing — continue to make changes based on its yearly performance reviews and continue to add to its roster of full-time officials. The guess here, though, is that nothing will ever work to get every call right to the satisfaction of every person watching.As long as there are humans playing, coaching and officiating, the human element will remain strong. What I’d suggest would help, though, is more accountability and openness from the league regarding officiating. The league has added some features to try to better pass along info to the public, such as its weekly film reviews of calls from the previous week’s games that it tweets out and makes widely available. But it might help if either the game officials, or someone with the league, were immediately available after games to take questions from the media in a news conference setting — same as coaches and players are — to discuss controversial topics. Officials are often interviewed, but those are done in private, with a preappointed pool reporter the only media person allowed to ask questions. The answers might not change much, if at all, if officials were made available for interviews same as coaches and players. But it would improve the perception of accountability.